This organiser is the PERFECT WORK COMPANION. Protecting and organising your belongings and keeping everything in one place in a secure manner, even when you’re on the go. This HANDCRAFTED, BLACK and RED folio keeps everything you need in one place and has MULTIPLE SMALLER POCKETS for all your essentials. The SMART DESIGN opens out fully, giving you easy access to everything. 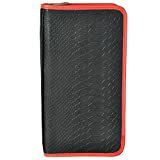 Designed with the modern professional in mind, it features 7 credit or debit CARD SLOTS, 1 COIN COMPARTMENT, a dedicated MESH POCKET for boarding pass or cheque book, a sim card, memory card and pen holder secured with a ZIP CLOSURE. With its Anaconda skin EMBOSSED TEXTURED exterior made from GENUINE LEATHER, your belongings are protected in the most stylish way. This UNISEX, SLIM organiser has a dimension of 24x13x3 cm. This organiser is the perfect work companion. Protecting and organising your belongings and keeping everything in one place in a secure manner, even when you’re on the go. This handcrafted, Black and Red folio keeps everything you need in one place and has multiple smaller pockets for all your essentials. The smart design opens out fully, giving you easy access to everything. Designed with the modern professional in mind, it features 7 credit or debit card slots, 1 coin compartment and a dedicated mesh pocket for boarding pass or cheque book, a sim card, memory card and pen holder secured with a zip closure. With its Anaconda skin textured exterior made from genuine leather, your belongings are protected in the most stylish way. This unisex, slim organiser has a sleek design and a dimension of 24x13x3 cm. This entry was posted in Luggage and tagged Anaconda, AzraJamil, Emboss, Genuine, Leather, Organiser, Skin, Snake, travel by Perfect Vacation. Bookmark the permalink.